BB19 WILL BE HELD AUGUST 9-10, 2019 IN THE DALLAS-FORT WORTH AREA. THE TICKETS COST $200 AND GO ON SALE OCTOBER 1, 2019 AT NOON CST. If you went to the 2018 - you know it was an amazing event for an amazing cause and 2019 will be even better! Hope to see you there! Please come by and celebrate the last Holidays event. I love these ladies and this event! I will miss it! Hope to see you helping raise money for a great cause! Come by and say hello!! JOIN US ON MAY 17TH FOR FUN AND SEMINARS. 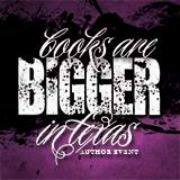 YOU WILL HAVE A CHANCE TO MEET YOUR FAVORITE AUTHORS AND LEARN FROM INDUSTRY PROFESSIONALS. RT'S LEAGUE OF EXTRAORDINARY WRITERS ROMANCE BOOK PARTY! ON FEBRUARY 21 AT 6:00 PM, DUNN BROS. COFFEE IN FRIENDSWOOD TEXAS, JOIN US FOR AN EVENING OF BOOKS, COFFEE, MUSIC, WINE, AND FUN AS WE CELEBRATE THE LATEST PUBLICATIONS FROM AND T.K. RAPP, AND KD ROBICHAUX'S DEBUT NOVEL. I WILL BE SIGNING AT PENNED CON IN ST. LOUIS ON SEPTEMBER 12, 2014. IN WHAT IS SURE TO BE AN AMAZING WEEKEND, THERE WILL BE TONS OF AUTHORS, BOOKS, SWAG AND SO MUCH MORE! CAN'T WAIT TO FANGIRL AND MEET SOME AMAZING AUTHORS!! HOPE TO SEE YOU THERE! AUGUST 16, 2014 IS SHAPING UP TO BE A NICE LOOKING EVENT! BE SURE TO CHECK OUT THE SITE ON FACEBOOK FOR MORE DETAILS! GOING TO BE IN THE HOUSTON AREA ON FEBRUARY 22, 2014? COME ON BY FOR THE HOUSTON AUTHOR BASH, HOSTED BY WINE & LABELS PRODUCTIONS. THE EVENT WILL TAKE PLACE AT THE HARMONY SCIENCE ACADEMY OF WEST HOUSTON. MAKE A DAY OF HANGING OUT AND MEETING SOME AWESOME PEOPLE! !